Competition in Korea’s instant noodle market is heating up with food processing companies seeking new business models to increase their revenues amid the growing demand of consumers to explore new tastes and quality products. A series of premium ramen products have debuted since last year, changing the entire market landscape, which was long dominated by cheap, traditional products that many were familiar with, but tired of. Premium ramen refers to an upgraded version of instant noodles that adds rich flavors and texture. The market response to this new ramen has been quite explosive, despite a steep price increase. They cost more than 1,000 won (85 cents) per packet, almost twice the price offered for regular varieties. Consumer groups, however, say that the entry of premium ramen has been devised as a part of companies’ marketing strategies to increase revenue. Companies feel pressured to raise the price of existing products, which have long served as a barometer of consumer prices. 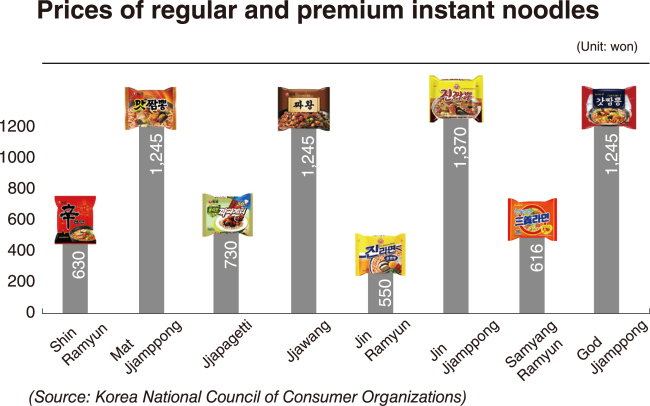 “Companies setting higher prices on premium ramen cast doubts, as they appear to be a tool to induce a price hike of the ramen product (in general),” said the Korea National Council for Consumer Organization in a statement. Despite concerns, premium instant noodles accounted for 61 percent of total ramen sales last month, a 22 percent increase from the same period last year, according to E-mart, a mega discount chain under Shinsegae Group. 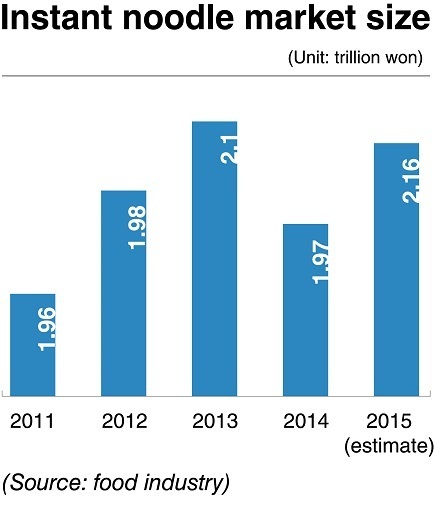 The average amount spent by a customer on ramen was 6,520 won last month, 17.3 percent higher than the average 5,559 won in February 2015, it added. Nongshim’s Chinese black bean noodle Jjawang and Ottogi’s spicy, seafood-flavored noodle Jin Jjamppong have led the market success, industry observers said. In particular, ramen products flavored like jjamppong -- a popular Korean-Chinese spicy noodle soup dish -- have had marked success in the market sensitive to weather. During the winter season, more than 50 million packets of Ottogi’s Jin Jjamppong were sold starting from its market debut in November. Nongshim’s Mat Jjamppong and Paldo’s Bul Jjamppong sold 45 million and 10 million units, respectively. With the temperature going up in the spring and summer seasons, bibimmyeon, a Korean sweet-and-spicy cold noodle dish, is likely to be the next hit in the market. Paldo has been leading the cold noodle segment, but is likely to face challenges from competitors. Samyang Foods recently launched Got Bibim, made with fermented radish kimchi. Nongshim and other companies are also planning to introduce bibimmyeon products in the near future. Thanks to the popularity of premium ramen, the size of the instant noodle market has grown at a rapid pace from 1.97 trillion won in 2014 to 2.16 trillion won last year. The size is likely to grow even further this year as companies are already in fierce competition to dominate the premium ramen segment. “The competition between Nongshim, which aims to consolidate its No. 1 position (in premium ramen), and Ottogi in second place will become a catalyst for market expansion this year,” said Kim Yun-oh, analyst at Shinyoung Securities. According to recent data released by Nielsen Korea, Nongshim and Ottogi hd a market share of 58.6 percent and 17.6 percent, respectively. Other market analysts also offer rosy prospects on premium ramen, citing the changing spending trend amid a prolonged economic recession. Rather than paying heftier bills at restaurants, more consumers want to have a unique dining experience at home and save money at the same time. The growing sales of premium instant noodles may demonstrate that they have succeeded in satisfying customers with quality and taste. “More and more cash-strapped customers are looking for ways to enjoy affordable luxury with premium food products, rather than dining out,” Oh Se-jo, business professor at Yonsei University, told local news outlet edaily.